Games: Community 75 and 90-ball bingo, video poker, keno, pokies/slots and instant scratchies. Bingo Australia is one of the top sites to engage in live community bingo games with others from around the country, and around the world. With 90-ball and 75-ball housie games, as well as progressive jackpot games, entertaining chat room games, and a host of bonuses and prizes to be awarded, as well as daily and weekly promotions, no longer does bingo need to be confined to old-age centres or weekend country football clubhouses where that one guy always gets way too drunk. To play real money bingo on the Internet, simply register an account (free of charge) at Bingo Australia – the sign up process requires regular details such as username, password, email address, date of birth, etc. Once you have registered, you become an instant member of the Bingo Australia online community, and are rewarded with a free $50 to roam the site, the bingo rooms and the games. New players are credited with a $50 free welcome gift; no deposits required. This $50 allows you to purchase cards/tickets* for bingo games of all formats to get a feel for how online bingo operates. Participate in live events and chat with other players – keep winning and keep using the cash. Note: no winnings from the $50 can be withdrawn into cold hard cash. The bonus credits are to be used on the site only. *We use the terms ‘bingo tickets’ and ‘bingo cards’ interchangeably. 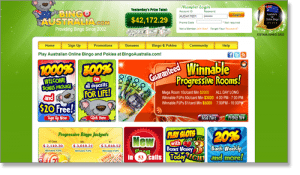 Bingo Australia is part of The Bingo Affiliates network – one of the oldest and most reputable online bingo networks in the world. 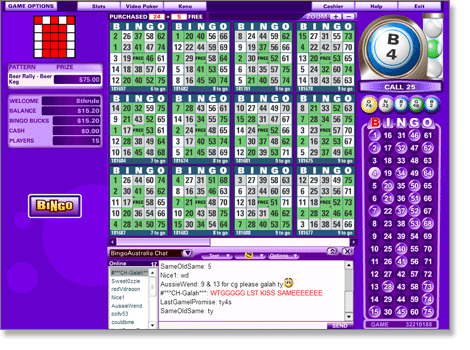 Players registering accounts at any of The Bingo Affiliates’ websites (such as Bingo Australia and AussieDollarBingo) can choose from USD or CAD, with other currencies converted at a small fee. There aren’t many online casinos which will match your deposits at up to 1000%. At Bingo Australia, you can grab up to a bonus of 600% on your first deposit, and up to 400% on your second deposit. While Bingo Australia is dedicated to providing fair and entertaining housie rooms, it also hosts some great online pokies, video poker, scratchies and keno titles – so if you’re a slots enthusiast or enjoy testing your skills in video poker (renowned for holding very low house edges), that 1000% bonus can go a long way if you wish to play lots of side games. Play online slots, video poker, keno and instants: There are 100+ popular titles available for real money and/or fun cash while you enjoy housie, or just to simply play separately from any bingo events. From 3D slots such as Lost and True Illusions, to full size pokies like Brazillions and Cash Detective, along with video poker titles like Jacks or Better, Five Draw Poker, Pyramid Aces and Faces, Multi-hand Deuces Wild and more, you will not be short on finding other casino games to play. Play these side games at www.BingoAustralia.com and get a two-tier deposit bonus of up to 1000%. Deposit an initial $1000 – get $6000 in bonus cash. Deposit $1000 thereafter – get $4000 in bonus money, for a total of $10K in bonuses. Bingo Australia hosts a range of different games, including 90-ball and 75-ball bingo. Games are played every four-five minutes on average, so you’ll always be able to jump in to a game that’s about to begin. Once you’re in the chosen room, you’ll be asked how many cards you wish to purchase. Usually, buying at least 12 cards will guarantee you an extra four free tickets at the very least. Buy more and be rewarded with more free cards. A countdown timer is present and the automated caller will inform you when ticket sales are closed; just as time is about to run out before the event commences. 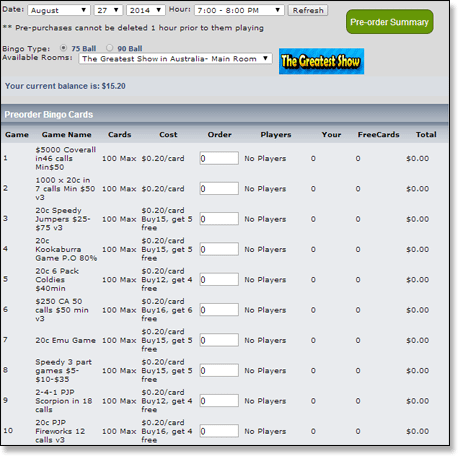 Once in-play, your numbers on your tickets are automatically marked off and your best cards are displayed at the top. Under game options, you can choose to turn off the voice of the automated caller, as well as alter settings such as the chat feature, auto-daubing (auto filling your cards), the quality of the graphics, how the cards are sorted, and more. The prize amount will be shown prior to the start of the event – the more players involved in the game, the higher the total prize money will be. If the game has a progressive jackpot, that will be displayed, too. 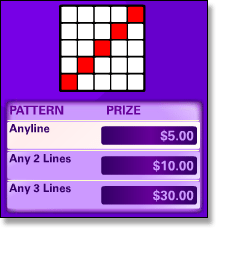 The pattern to be filled (for 75-ball games) is also displayed in the top right corner of the new window which opens when you enter a room, while 90-ball games simply show the one line, two line and full-house displays. When someone hits bingo, the game ends and that player (or players if bingo is hit at the same time) is/are immediately awarded their share of the prize money. As always, chat hosts are there for any questions. Chat with other players and enjoy the side games while participating in the live events. You can also go directly to the cashier is you wish to deposit more funds from the playing room. One of the best features of Bingo Australia is players can pre-purchase their housie tickets via the pre-order form. Accessed via any game or the bingo home lobby, this sheet displays all the upcoming events for the days and even months in advance, showing price per ticket, the name and format of the game, how many players are involved, the maximum amount of cards you can buy, and of course, an area for how many you wish to purchase. – You do not have to be in the room for the games in which you’ve bought tickets. – You can pre-order cards even if your current balance is less than what is required for the purchase. Your order will be charged from your account when the games begins. The Bingo Australia schedule also shows you a list of upcoming events with progressive jackpot prizes listed adjacent to the games. What are bingo progressive jackpot (PJP) games? 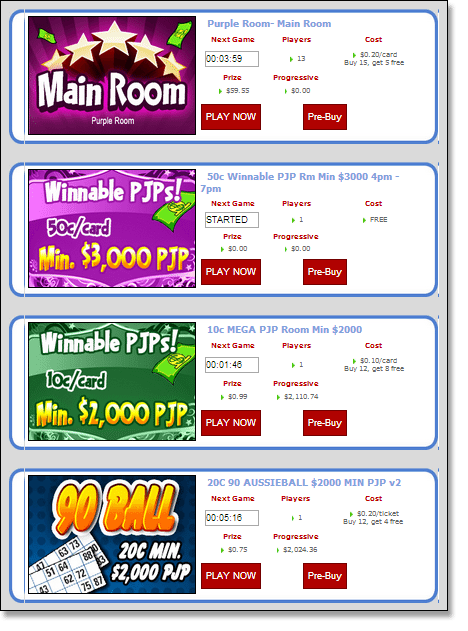 These tournaments hold large jackpots as prizes, usually won if a player hits bingo within a pre-set amount of calls, such as 50. If no-one wins the jackpot, it steadily increases. Some PJPs will guarantee a jackpot winner. 300% Matched Deposit Bonus for Life: After your first two deposits, you will granted a 300% bonus every time you deposit thereafter – for as long as you remain a member – fund your account with another $100 and you gain an extra $300 for free on top of your $100. Bonus Bucks: 100% of each bonus goes towards Chat Bonus Bucks (BBs) which are earned playing chat games and unique mini competitions within the rooms. Players can exchange BBs for real money – find out more about Chat BBs. Daily Reload Promo: There will always be other exclusive promos running each day for those who are consistent depositors – after your second deposit, any future reloads can earn you even more credits. BA’s Loyalty Rewards Program: Automatically start at the Yellow Opal level and climb up the loyalty ladder to receive some great prizes. There are seven levels in total and the higher you climb, the better the rewards. Benefits include: cash back, increased daily deposit limits, superior deposit offers applicable to VIPs, anniversary gifts, birthday BBs and more. Team Bingo – Team bingo takes us back to the classic bingo days where friends and families would head down to the local club and enjoy a night of housie. Hosted every Saturday and Sunday at 7pm, team bingo allows groups of friends to join forces and play for the chance to win a share in $5000 and sometimes more. Teams must register at least an hour prior to the tournament. Find out more about team bingo here. Knock, Knock Lotto: Deposit $50 any day from Friday 00:01 to Wednesday 23:59 and you can play Knock, Knock Lotto. Select five numbers from 1-75 and every Thursday at 1pm AEST in the ‘Progress CA in 49 calls + 20c PJPs’ game, the first five numbers drawn are used to determine the lotto winners. $750 Coverall: The $750 coverall is a new tournament held multiple times throughout the week (usually at 10pm) where players need to cover their entire ticket within 53 calls to win $750. Simple and fun. Refer a Friend: Sounds simple enough – refer as many friends as possible and for each person you refer who deposits and plays at Bingo Australia, you’ll receive $50 in withdrawable cash. Read over the refer a friend terms and conditions here. Players can use a number of safe and reliable banking methods to finance their bingo accounts, including credit and debit cards (MasterCard, Visa), ecoPayz, e-wallets like Neteller and Skrill (Moneybookers), Paysafecard and also direct wire transfers. All deposit and withdrawals are protected with SSL technology, deposits are processed instantly, and withdrawals are processed as fast as possible, usually no longer than 72 hours. Parlay Entertainment (Parlay Games Inc); a Canadian-based provider of online and interactive bingo and other casino games, is regarded as one of the most trusted and secure leading companies in the online bingo and casino industry. Developing software for sites across the Internet since 1998, graphics and gameplay have improved significantly and software is designed to work safely and securely. Bingo players should have no qualms playing games run by Parlay Entertainment. Monday to Thursday from 4:00pm – 2:00am AEST. Friday to Sunday from 10:00am – 2:00am AEST. Note: Bingo Australia and Aussie Dollar Bingo are sister sites and a player can register accounts with both. However, once you credit your account with real money and want to cashout at at any stage, you will only be able to use on of the accounts to do so thereafter. Sign up at Bingo Australia, use your free $50 bonus to enjoy all rooms (open 24/7), and take advantage of the 1000 per cent matched deposit bonus.